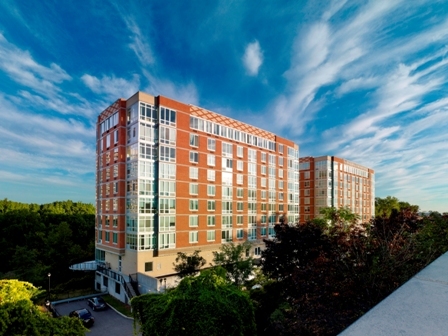 PALISADES PARK, N.J. – – Trio is preparing to kick off summer with significant sales momentum at the upscale collection of 140 condominium homes in Bergen County’s Palisades Park. Most notably, several homes have been sold over the past few weeks as savvy homebuyers rush to take advantage of a limited time $25,000 incentive program that provides tremendous savings on their new home purchase. The special offer has been particularly popular with first-time homebuyers such as single professionals, young couples and growing families who have found the unique opportunity too good to pass up. The noteworthy announcements do not end there. Many of these recent homebuyers are beginning to close on their new residences and start a new upscale urban lifestyle steps from New Jersey’s popular Hudson River waterfront at Trio. “The spring selling season has certainly heated up as our interested prospects are quickly turning into buyers in order to take advantage of the incentives before it’s too late,” says Ron Orgel, a representative of developer MWHF Palisades Park. “With owners now living in the building, visitors can see that we’ve created one of Bergen County’s most desirable residential addresses by combining luxurious for-sale condominiums, a wealth of on-site recreational amenities and a desirable commuter friendly location. Trio’s buildings feature one-, two- and three-bedroom homes – including spectacular Penthouse residences, priced from $310,000. The condominium residences range in size from 742 square feet to 1,751 square feet and boast designer elements including floor-to-ceiling windows, hardwood floors and modern recessed lighting. Gourmet kitchens include granite countertops, stainless steel GE appliances, custom maple cabinets, and Kohler fixtures. Designer bathrooms boast Crema Marfil marble floors, granite countertops, custom maple vanities, and Kohler fixtures. All homes come with an individual washer and dryer. Immediate occupancy is available. Located at 800 12th Street in Palisades Park, Trio is ideally situated in an established residential neighborhood minutes from the George Washington Bridge and a number of transportation options including bus and NY Waterway Ferry service into Manhattan. Shopping enthusiasts will find myriad opportunities at nearby malls, such as Riverside Square and Garden State Plaza, while a host of brand-name stores, specialty shops and boutiques line Route 4 and Route 17. Residents also enjoy an exciting suite of newly-renovated, five-star recreational amenities including concierge service, a lounge featuring billiards, ping pong and large screen TV with catering kitchen; state-of-the-art fitness center, yoga studio, children’s playroom, game room, virtual golf simulator, outdoor terrace and a business center all located within the buildings. Covered parking is also available.